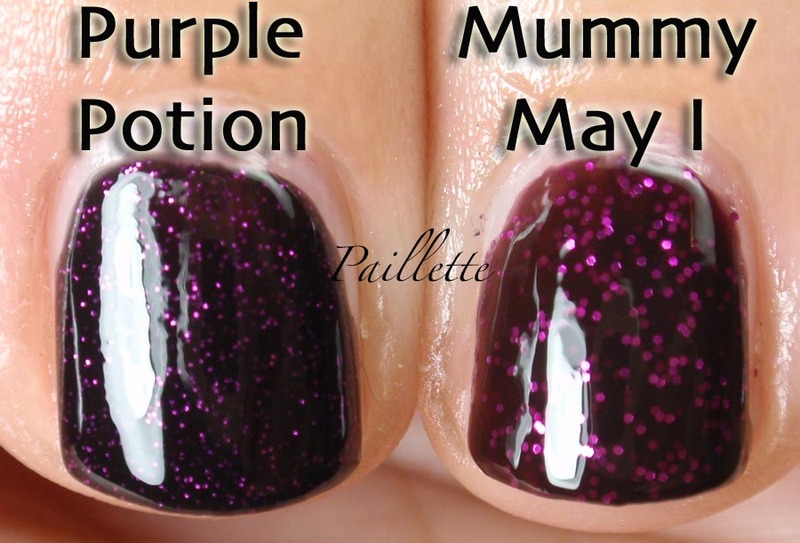 China Glaze came out with Mummy May I in their 2010 Halloween collection. Nice! A rich magenta glitter bathed in a deep maroon base. This is three coats. I have it alternating with and without topcoats. Left to right: topcoat, none, topcoat, none, topcoat. Without a topcoat the glitter is a bit on the bumpy side, not as bad as Ick-A-Bod-Y, but definitely there. With glossy topcoat, it really is nice. 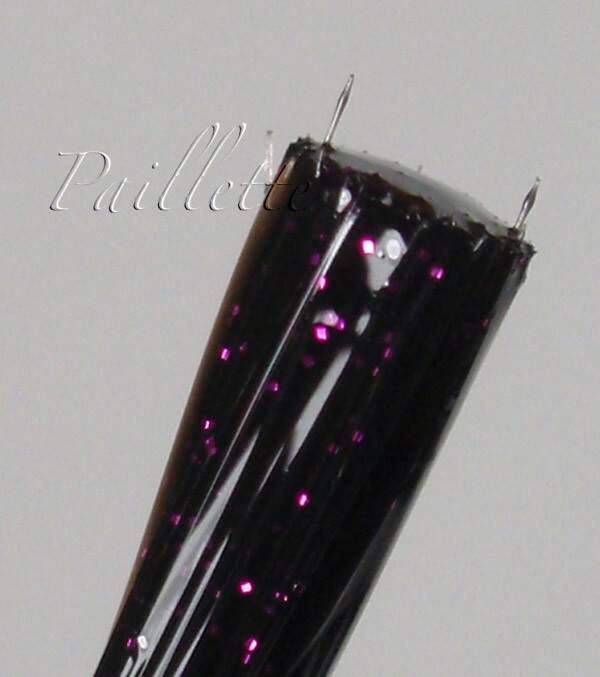 Another magenta glitter, this time smaller and in a black base. This is three coats. Topcoat action from left to right: topcoat, none, topcoat, none. So, you can see there is some texture without a topcoat., but with one, the light is nicely focused on the glitter! One thing I must say: I love how drugstore companies make the extra effort to think about packaging. Salon brands think all they have to do is wow us with their colors and formulas - and they do! 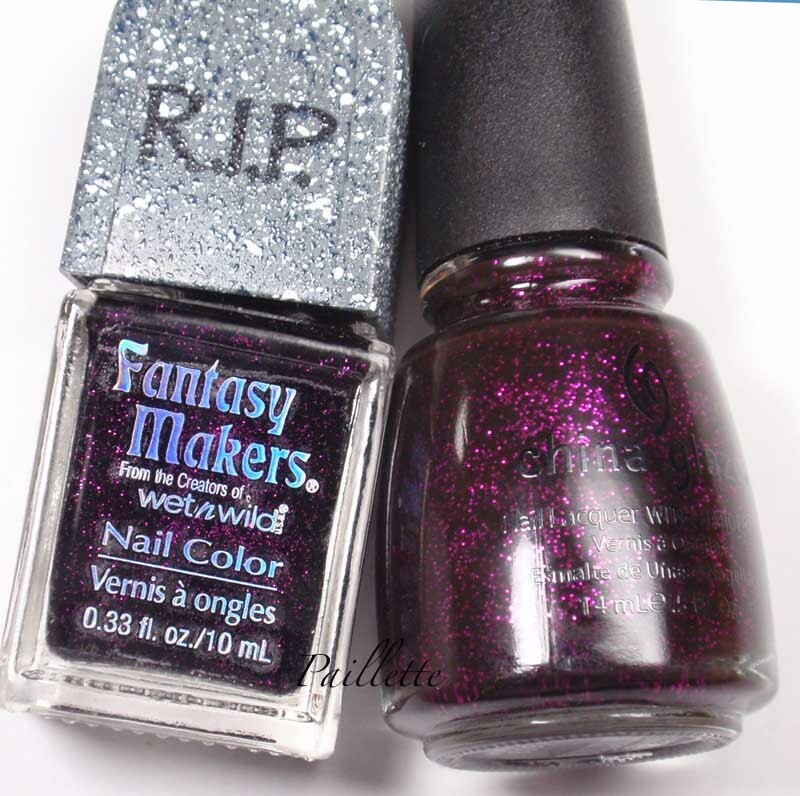 - but sometimes you have to love the little pop of design fun that is a headstone on a bottle of nail polish. Fun! Little to fault, I really enjoyed wearing it! Finally there is a comparison! Truly a case of "my aren't they similar" but really they are nothing like each other. PP builds to a rich dark base, but still has the glint of the glitter, MMI has that dark maroon base, which really seems to show well in this photo. Alone you think black, or even brown, but you can see it's neither. Of course I love both. I didn't do a double layering, not sure why, but I think together it could be interesting and complementary. Hmmm...now I need to try this!! Of course you can see you get a lot more polish from China Glaze, though the price reflects it: $1.99 versus $2.99 plus shipping. I don't have a calculator handy, but I feel the breakdown is pretty close. Lol@ the fangs! Thanks for the comparison! Thanks for the comparison. This makes me want Mummy May I. And every one of my WnWs has something wonky going on. Makes me run from the brand a bit. Yeah a lot of matte-ish finishes on these, I wonder if this is on purpose or not! I agree WnW has the cheapest brush production operation on the planet. You'd think they'd up the ante a tiny bit.